This was released on May 2007 in Japan. Item is new and unopened, mint condition. 2015 hot wheels walmart exclusive batman claasic tv series batmobile. Sealed and new. Minor dings on lower corners. This hot wheels is for the elite collector only. VERY ELITE COLLECTOR! This is a super rare item for the elite collector only. Most or all of the elite Hot Wheel collectors in the world do not have this. This is 133/190 and it is # P2453, sold in 2009. Faster Than Ever series. 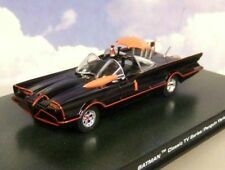 This Glossy Black 2007 new model (# 15 of 36) is from the 1966Batman TV Series. I have taken many pictures to show every angle and have tried to describe all features and/or flaws to the best of my ability. It is in a nice blister card. 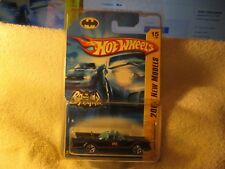 2007 HOTWHEELS 1966 TV SERIES BATMOBILE #15/180. Condition is New. Shipped with USPS First Class Package. 2007 HOTWHEELS. on "New Models" card. 1966 BATMOBILE -TV SERIES " HOT WHEEL'S " MOC " 2007 LARGER SCALE ! MINT IN CARD! NEW NEVER OPENED OR PLAYED WITH! OUT OF MY COLLECTION. . Hot Wheels 2007 New Models mainline die-cast vehicle. This item is on aFULL length nearmint to excellent condition card. 2007 Hot Wheels First Edition Mainline Car. Series: New Models. Collector # 15. 2014 Hot Wheels City. On very good Short Card. Both original Batman and Robin still occupy their cockpit. Both doors & Bat hubs still retain their vivid Bat logos on both sides. Suspension is flat, doesn't seem to be bad, as it rolls very smoothly, the paintwork finish on this example outstanding it’s so glossy. 2009 Hot Wheels - RARE Japan Issue. MADE IN HONG KONG BY OK TOYS AND NUMBERED 332 TO UNDERNEATH, THIS IS A FRICTION POWERED TOY FROM AROUND THE 1950's. THE FRICTION MOTOR SOUNDS LIKE IT IS WORKING, BUT THE CAR DOESN'T MOVE VERY FAR WHEN YOU TEST IT. GREAT EAGLEMOSS BATMAN AUTOMOBILIA DIECAST 1/43 1966 CLASSIC TV SERIES BATMOBILE. Condition is New. Dispatched with Royal Mail 2nd Class. Once all the tyres were used, they went back to black. Gloss Black with tow hook. Excellent condition this is the one you want. Original car is in excellent condition available. All photo's show the car as it is. Note; robin is missing, wind shield is broken. Make:- HOT WHEELS 2017 Model:- 1964 LINCOLN CONTINENTAL Colour:- Brown Series no:- HW ART CARS 2/10 15/365 Card:- Short. It is in a nice blister card. Character Family Batman. Series Hot Wheels Classics. Features Limited Edition. Gender Boys & Girls. Color Black. Vehicle Type Car. Vehicle Year 2018. Year of Manufacture 2018. Series Hot Wheels Classics. Color Pink. Vehicle Type Car. Le modèle visible sur la photo est celui que vous allez recevoir ( modèle, couleur.). BAD MUDDER 2. REBELS RIDES. 2009 HOT WHEELS. condition is mint to near mint condition. Year of Release 2009. Scale 1:64. Paint is factory original and nice and glossy with a mint box. Character Family Batman. This is 133/190 and it is # P2453, sold in 2009. Faster Than Ever series. Series Hot Wheels Faster Than Ever. Features Unopened Box. Country/Region of Manufacture Malaysia. Material Cast Iron. Corgi 267 Batman. All are original parts, tires are original but need replacing, stuff you do need like good slasher and good spring. The rocket tubes and horns are in ok condition. for spares or repair only.